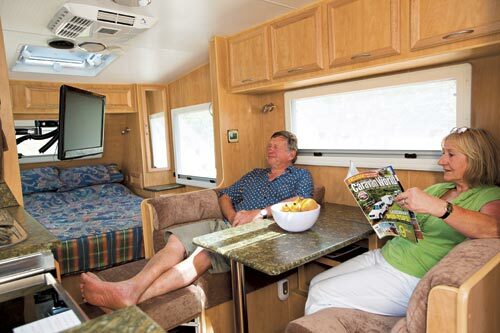 Building a custom caravan may seem a bit beyond many vanners, in terms of budget and expertise. 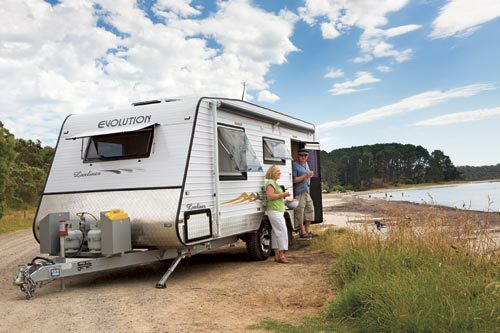 But Evolution Caravans in Somerville, on Victoria's Mornington Peninsula, is a custom-caravan specialist. The company has been building vans for the past six years and the team behind Evolution has more than 35 years' experience in the industry. Clients can design their own personalised van from scratch or they can choose to adapt the manufacturer's existing models. 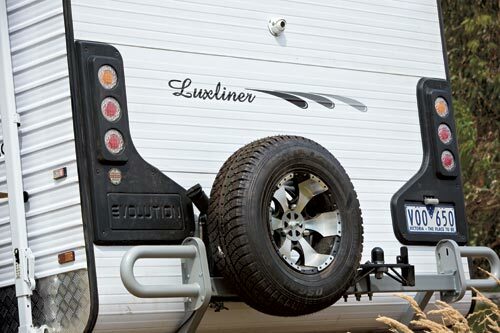 The Luxliner is Evolution's most popular model and it comes in several body lengths. Our review van was a 6.2m (20ft 4in) Luxliner, customised for Victorian couple Heather and Tony Jarvis. Making clients' dreams come true is the manufacturer's business, said Evolution's Chris Shambrook. "We rarely say no to anything and if we don't have it, we'll go out and find it," he said. With all its inclusions - and the list is seriously long - this Luxliner comes in at a shade over $61,000. Not bad for a full-ensuite van, jam-packed with features, some rough-road capability and designed to suit your every need. Evolution helps clients keep the cost of their new van low by including only the options they want and not filling the van with things they don't need. 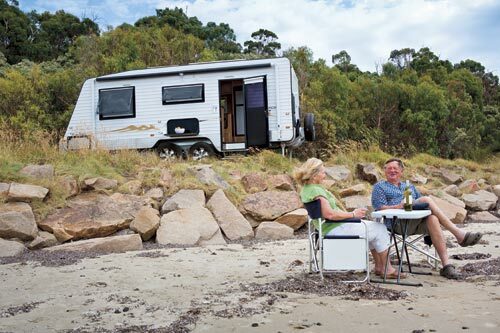 The Luxliner is billed as a 'semi-offroad' model, suitable for taking you beyond the blacktop and across most corrugations, but probably not through deep creek crossings or the Simpson Desert. And with tandem-axle independent Simplicity suspension, a 4in DuraGal chassis with 2in riser (and 6in A-frame), decent checkerplate protection and high ground clearance, it appears to have the goods to back up its claim. 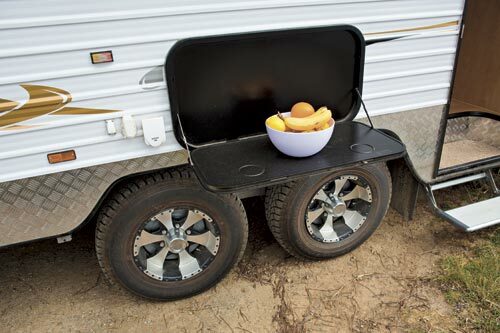 The outside of the van is packed with features, making it perfect for long summer evenings at camp. 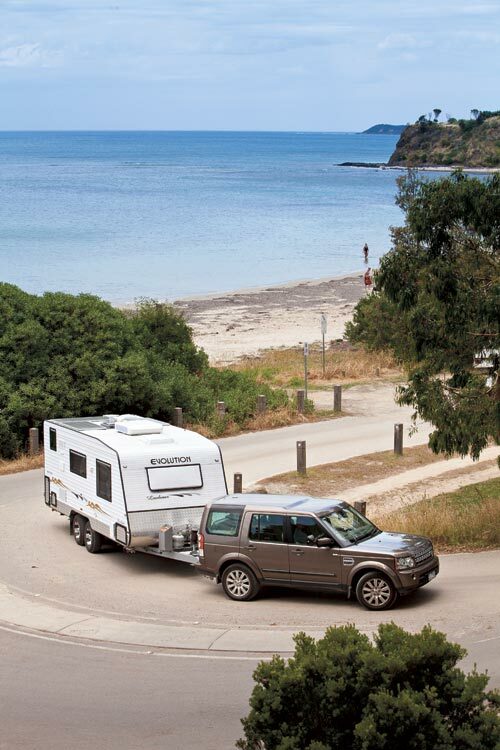 There's a rollout Aussie Traveller Sunburst Eclipse awning, annexe light, external TV point and fold-out picnic table. 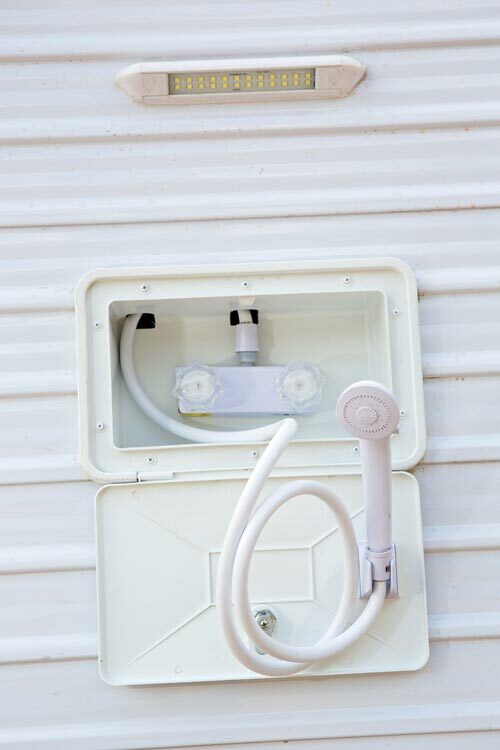 There's also a reversing camera and an external shower, which is great for when you're parked near the beach or river and don't want to trek sand or mud through the van. And if outdoor pursuits are your thing, or you just want a cheap and efficient way to travel once you've unhitched the van, the rear bike rack provides storage for a couple of pushies. At the front, sitting against the backdrop of the polished aluminium checkerplate, are twin 4.5kg gas cylinders (the Jarvises had these reduced from 9kg bottles, which are also available) and two 20L jerry can holders, which were added at the owners' request. The van hitches to the tow car with an Al-Ko 3500kg fixed ball coupling. 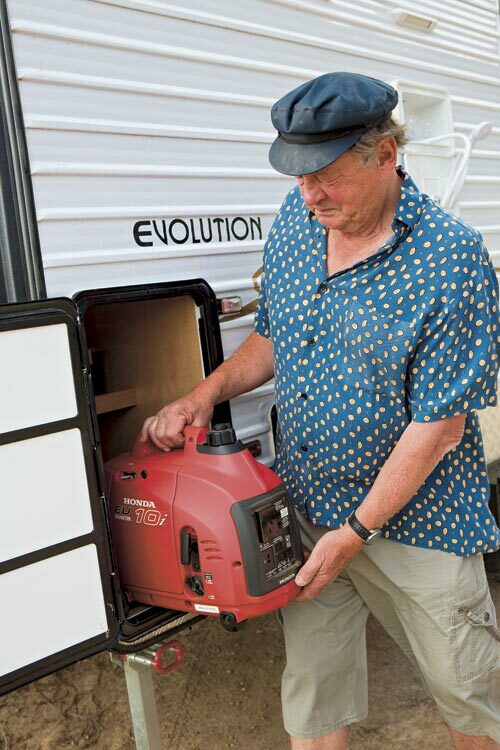 There is no front boot in this van so external storage comprises a full-width front tunnel boot, an offside rear locker which houses the generator, and a smaller locker next to that. Inside the van, you really don't want for anything - the Jarvis' have seen to that. Entry to the van is through the rear door via a manual, aluminium Tecno Step. The front-bedroom, rear-bathroom layout seen in many modern vans is a practical and proven floorplan and has been employed here. But while most Luxliners have a central entry door, you enter this van by the rear door. The owners opted for a pale timber interior, with Tasmanian oak-framed cupboards and high-gloss timber ply, accented by deep green-flecked rolled-edge benchtops. It is warm and welcoming and suits them perfectly. But if the colour scheme isn't to your liking, Evolution offers a plethora of other options and will tailor a colour scheme specifically for you. To the right of the entry, and taking up the full width of the Luxliner, is the rear bathroom - the highlight of this van. 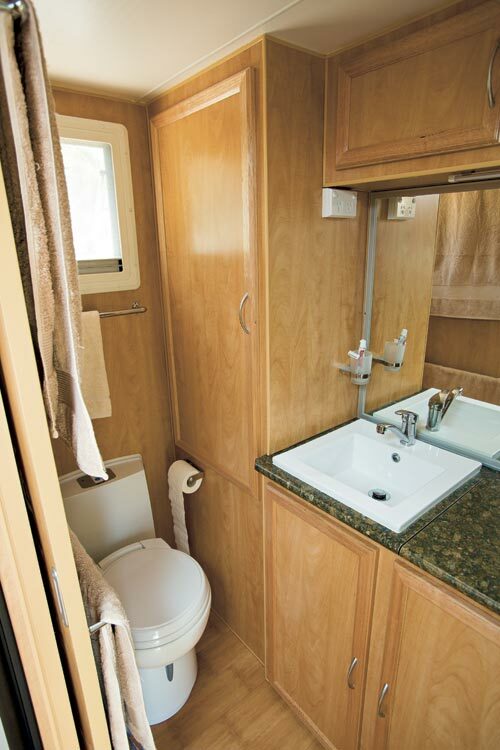 Separated from the rest of the van's living space by a sturdy sliding door, some thought has been put into the bathroom's layout, resulting in a functional, feature-packed ensuite with a generous variety of storage options. 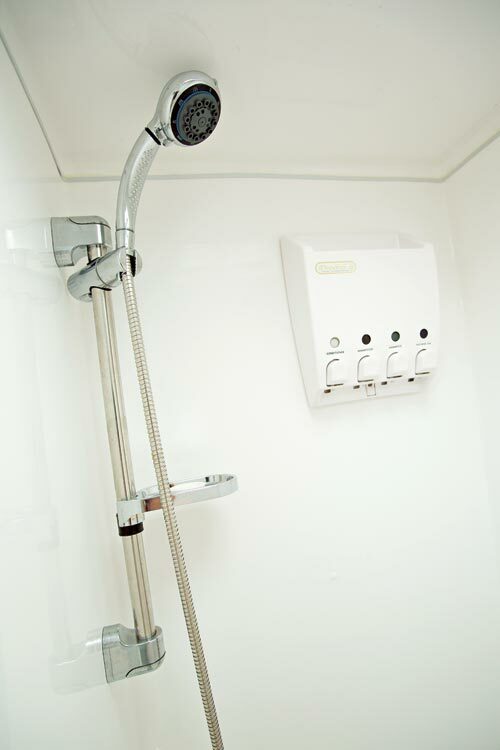 A ceramic Thetford cassette toilet sits on the offside with a towel rail and ventilation hatch on the wall above. There are two larger towel rails on the back of the sliding door, so keeping those wet towels off the floor won't be problem. A large vanity is set into the middle of the rear wall with a Ceramix sink, mixer tap, huge mirror and a top-loading washing machine with a pull-down lid which creates more bench space. I've left the best until last here - and that is, without a doubt, the enormous shower in the nearside corner. The cubicle is fully-moulded with a pivoting glass door, has a variable-height flexible-hose shower and, in order to give you an accurate idea of its size, I will say it's easily big enough to fit two adults or several small children. Water saving, anyone? 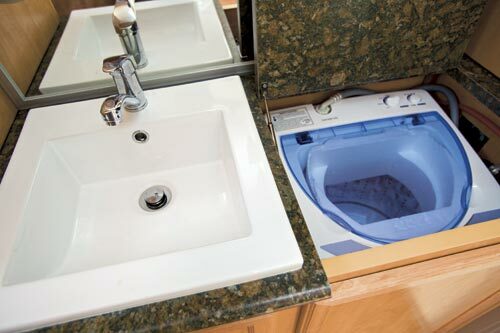 The other great thing about this bathroom is the sheer amount of storage space available to its occupants. There is a massive linen press with three shelves in the offside corner, two cupboards above the vanity and two below - so if you can't fit all your towels, sheets, and bits-and-pieces in here, you're definitely packing too much. Turn your back on the bathroom and the rest of the van is in front of you. Directly opposite the entry door, on the offside, is the Waeco 175L RPD compressor fridge-freezer which sits off the floor, allowing enough space for narrow cupboards above and below. The comfortable dinette, with its tri-fold single pole-mounted table, commands the mid-offside section of the van. With thick, squashy, latte-coloured cushions that envelop you as you sink into them, this dinette is the perfect place to relax, read, watch TV, or just sit quietly with a cuppa and a copy of CW. The Jarvis' have further increased the comfort factor of the dinette by adding a hinged footrest to one of the seats. When up, it increases the length of the seat and in its 'down' position with the removable cushion stored safely away, it matches the timber cabinetry of the rest of the van. Underneath the tri-fold table are two useful shelves and there is a double powerpoint and three top-hinged cupboards above. 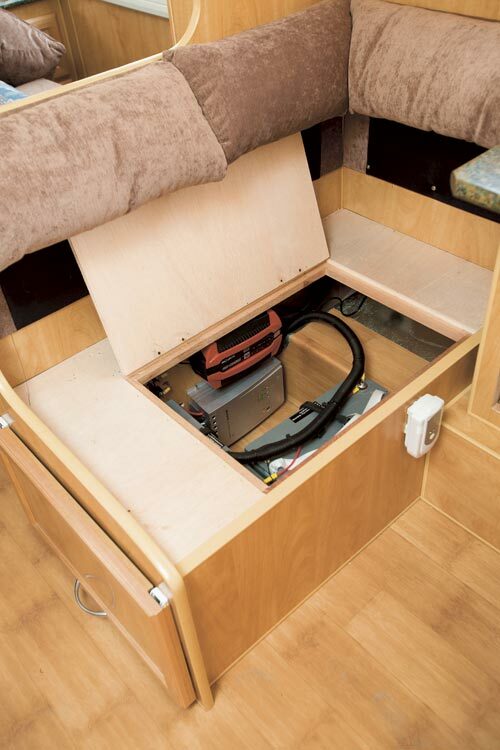 The two 150Ah house batteries and battery charger are stored under the dinette seat - out-of-the-way but easy to access. 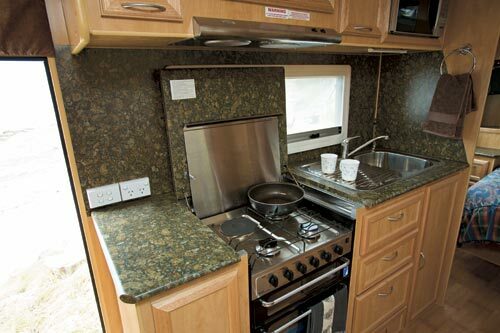 While there is enough room to walk between the mid-nearside kitchen and the dinette with the footrest extended, it will have to be stowed if you want to work at the kitchen bench. Permanent bench space is at a premium with just one section of benchtop next to the entry door but, fortunately, extra space materialises when you shut the matched lid on the recessed Swift four-burner cooktop (with oven and grill below, and microwave overhead) and pop the timber chopping board insert over the stainless steel sink (with drainer). Once you've done this, you should have no problem whipping up a meal. Storing your kitchen essentials will be a breeze with four drawers and a tall cupboard under the sink and drainer, a cupboard under the bench, and three top-hinged cupboards. There is a large window above the sink and the kitchen benchtop extends around this and up the wall next to the sink, creating a full-height splashback to aid easy cleaning. 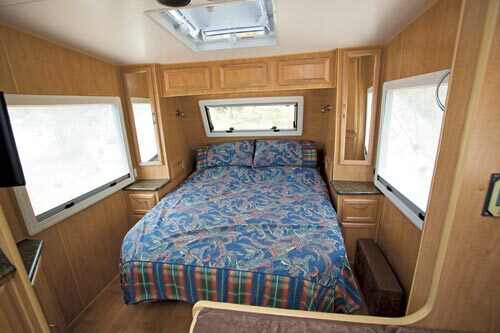 At the front of the van, under a row of three overhead lockers and a large window, is the north-south queen-size bed (5ft x 6ft 2in). 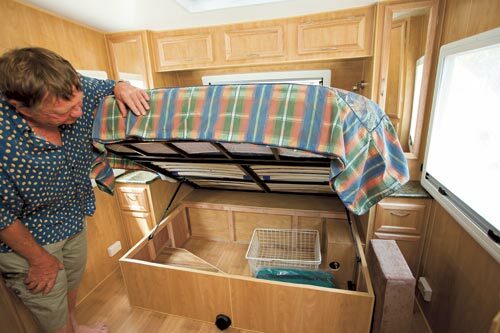 The bed is on gas struts, so lifting the base to access the cavernous storage space beneath is quick and simple. This area is ideal for larger items, as it is not compartmentalised and small bits and pieces may slide around during travel. On each side of the bed is a half-height wardrobe with mirrored door and small shelf, drawer and cupboard below. In the nearside corner at the foot of the bed is a cupboard with a shelf and the TV above. On the opposite side are two corner cupboards. There is a reading light on each side of the bed and double powerpoints on both sides, so there'll be no arguments over whose phone gets to charge at night. Another corner cupboard, above the 22in flatscreen TV which is mounted on the nearside between the kitchen and bedroom, houses the Sony CD/MP3/DVD entertainment system. A standout feature of the van, and one the owners are particularly happy with, are the two different roof hatches. There is a Four Seasons hatch in the roof above the bed and adjacent to the remote-controlled Aircommand Ibis air-conditioner but, for something a little different, the Jarvises installed a Heki skylight in the roof of the living area. 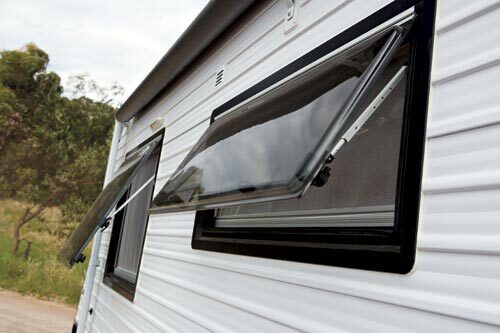 The skylight comes with sliding screens to provide shade or let in the sun. 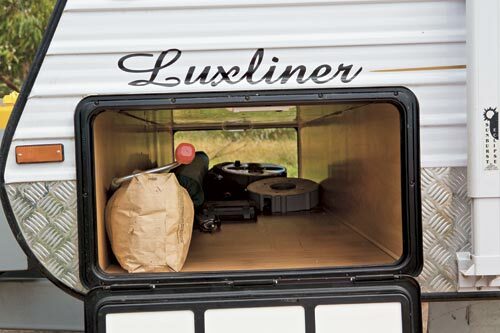 With its white-clad body, black trim and window frames, and gold decals, the Luxliner is a very attractive van and what's on the inside is just as pleasing. The van has everything a touring couple could want - and probably more. 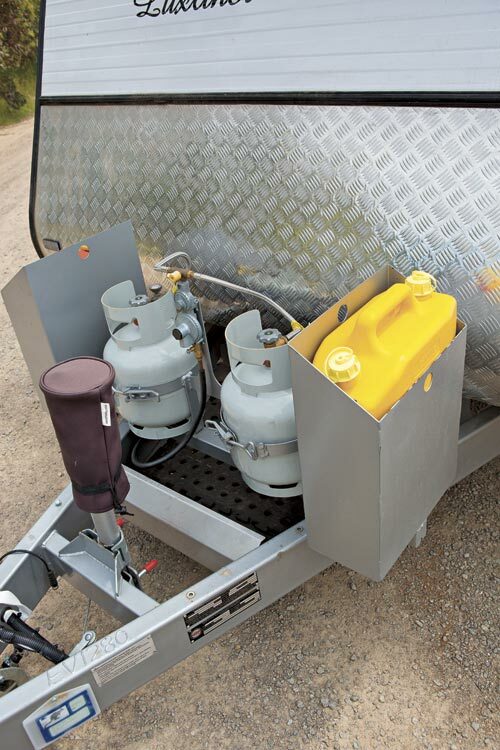 With a Tare of 2520kg and an ATM of 2920kg, a fairly substantial tow vehicle is required, though. The Jarvises upgraded to a Discovery and think it's perfect for the job. 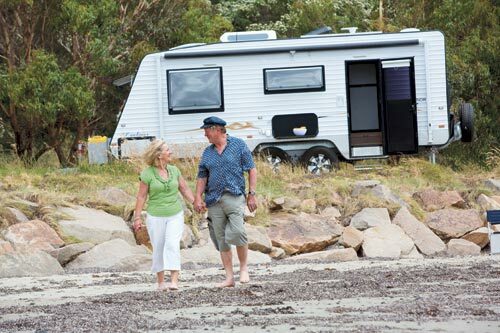 Luxliner owners Heather and Tony Jarvis are relatively new to caravanning, but they are camper trailer enthusiasts from way back. 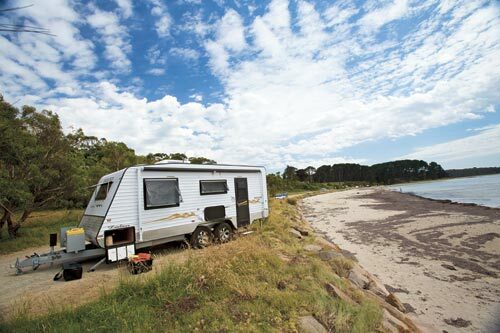 They enjoyed getting off the beaten track in their offroad camper but, after moving down to Victoria's Mornington Peninsula from sunny Queensland, they decided to upgrade to something a bit more comfortable and suitable for the conditions. "We went away in our camper after we moved here and we were camping in a van park and it was freezing cold," Heather recalled. "We were the only ones sitting outside cooking and we thought there's got to be a better way." 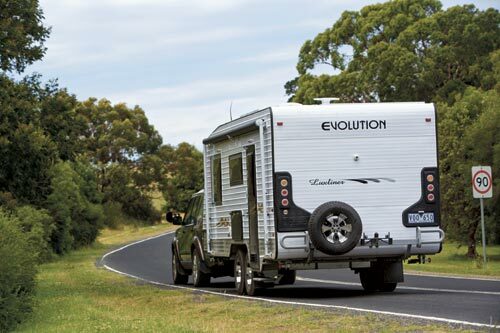 They chose Evolution because of its proximity to them - although the factory is in Epping, Vic - and because they wanted the freedom to decide exactly what went into their van. Heather's non-negotiable item was a washing machine, which is fitted into the spacious bathroom. Tony, on the other hand, wanted to ensure they were completely prepared to head bush. "We piled a decent amount of solar into it so we can be reasonably self-sufficient," Tony said. There are three 140W panels on the roof, as well as two 150Ah deep-cycle batteries. Other creature comforts that the Jarvises enjoy are air-conditioning, courtesy of an Ibis Aircommand unit, and a diesel heater to keep them warm when they're away from mains power. Heather was keen to try life without an oven, as the couple prefer to do the majority of their cooking outside, but the Victorian weather and the potential resale value convinced the couple to install a Swift four-burner combo cooktop with oven and grill. As the list of features increased, so did the van's length and weight. 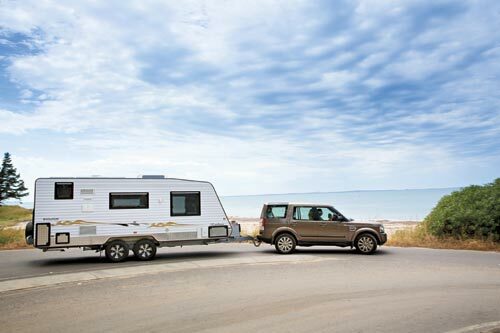 At 6.2m (20ft 4in), it is slightly bigger than the 19ft the couple originally planned for and they had to upgrade their Toyota Prado to a Land Rover Discovery in order to tow it legally. 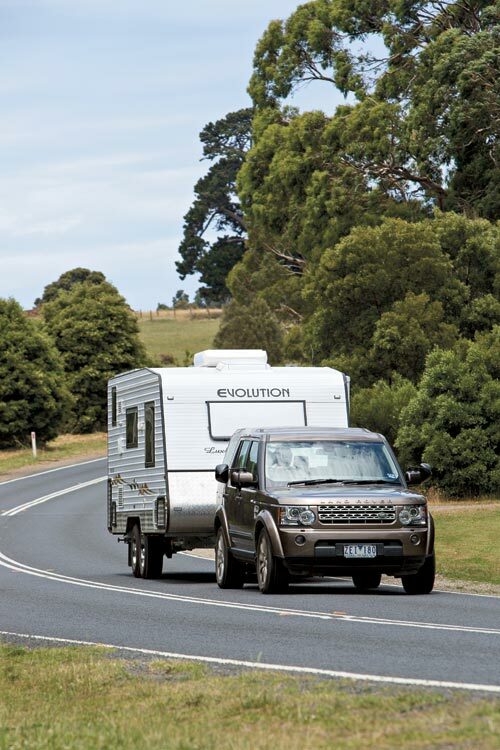 "We wanted to keep it smaller for offroad camping but then we decided, as we were getting a bit older, we wanted a few creature comforts," Tony said. Having received the van just weeks before CW arrived to have a look, the couple hadn't had time to really put this van to the test. They'd towed it on a few short trips around Victoria but plan to travel to South Australia later this year.